One of the common misconceptions about Israel is that our daily food intake consists primarily of falafel and hummus. While there is truth to this – we are in fact a hummus and falafel-obsessed society – Israel’s culinary scene, and Jerusalem’s in particular, has diversified and flourished over the years, offering locals and visitors a range of culinary options, on par with any international city. Therefore, while we may be hummus-obsessed, you are more than likely to come across a sushi-obsessed, latte drinker on your visit to Jerusalem. Jerusalem has a huge range of dining options, including chef restaurants; French Italian and Japanese eateries; cafes (which often specialize in the famous “Israeli breakfast”); meat restaurants, and, as expected, Middle Eastern cuisine. With an increasing number of Jerusalem chefs training at top culinary schools and restaurants in Israel and abroad, Jerusalem is increasingly becoming home to top-quality cooking. A trend in the past few years is the opening of restaurants that offer traditional Middle Eastern food with an innovative twist, or menus that consist of a fusion between traditional and modern. Other trends include an increase in the use of fresh produce and organic products, as locals and visitors become increasingly health conscious. This is particularly common in Mahane Yehuda market restaurants, where chefs rummage the local produce stands on a daily, sometimes hourly basis. Kosher dietary laws also add an interesting perspective to the local culinary scene. Most of Jerusalem’s restaurants – although not all – adhere to kosher standards, meaning that they use ingredients derived only from kosher animals and from those animals that were slaughtered in a ritually proper manner. They also don’t combine meat and milk, meaning that chefs often come up with interesting alternatives to dishes that traditionally do. It also means that most restaurants will have menus that consist of meat only, or milk only. For example, you won’t find meat toppings in a kosher pizza place or Parmesan on your bolognaise dish in a kosher restaurant. You won’t be losing out however, as kosher restaurants in Jerusalem have extensive menus, with top quality food. Kosher restaurants generally have kosher certification on display. Most are closed between sundown on Friday and sunset on Saturday. For your convenience, restaurants on the iTravelJerusalem.com website are divided into the following categories: cafes, fish and sushi, restaurants open Saturday, Italian, kosher restaurants and recommended restaurants. Jerusalem’s restaurants are scattered around the city, but the main areas are the city center, Mahane Yehuda Market, the Old City and the German Colony. We’ve provided an overview of what to expect in each area as well as some restaurant suggestions. Enjoy your culinary adventure in Jerusalem! The Old City may be where one goes to see places of religious importance, but that doesn’t mean that one can’t find time – between visits to holy sites – to sample some of the best traditional Middle Eastern cuisine that Jerusalem has to offer. The Old City has a unique combination of casual, market-style food such as falafel, shwarma, fresh juice and traditional sweets for those eating and drinking on the go, and more formal, atmospheric eating for those looking to get out of the sun and enjoy a sit-down meal. A definite highlight of the Armenian Quarter is the Armenian Tavern, near the Jaffa Gate, which serves traditional Armenian food and is located inside a 1000-year-old building that was once part of a Crusader cloister. Its décor consists of endless artifacts. Here you can sample home-style food prepared with special Armenian herbs and seasonings. The Jewish Quarter has numerous food vendors which are in close proximity to the Western Wall. In addition to traditional Middle Eastern food such as shwarma and falafel, the Jewish Quarter also has fast-food options and restaurant chains such as Burgers Bar and Holy Bagel. For those looking for a more formal setting, check out the Jewish Quarter Cafe, a restaurant located in close proximity to the Western Wall. Head to the Christian Quarter for some hummus at one of Jerusalem’s leading hummus restaurants, Lina, which offers a hummus-only menu. Located close to Station 8 of the Via Dolorosa, Lina serves a number of variations of the traditional hummus dish, such as hummus with pine nuts or hummus with beans. Grand Six Bar & Cafe, just inside Jaffa Gate, is a great destination for those seeking wine, hot beverages, Taybeh beer or international beer. The Muslim Quarter is known for its fresh fruit stands, traditional sweets, special breads and outstanding hummus. Make sure to check out Abu Shukri, a small, family-run restaurant in the Muslim Quarter which isn’t on the fancy side, but does offer seating, and an escape from the heat, unlike some of the other food vendors in the Old City. Complete your meal or snack with a sampling of some traditional desserts at one of the many sweet shops in the Old City. Jafar’s Sweets, in the Muslim Quarter, is a sure highlight with its delicious Knafeh dessert – an Arab cheese pastry soaked in sweet syrup. Mamilla is one of the upmarket areas in Jerusalem. Located between the city center and the Old City, it contains luxury shops, upscale restaurants and cafes, and a spectacular view of the Old City. Perhaps the best place from which to enjoy Old City views is the Rooftop restaurant, located on the roof of luxurious Mamilla Hotel. The restaurant offers lunch and dinner, and the menu consists of grilled meat and fish dishes, fresh salads and pastas, as well as desserts. Finish your meal with a visit to the hotel’s Mirror Bar, where you can enjoy a drink or aperitif. For those looking for a bite on the avenue itself, check out Cafe Cafe, a moderately priced dairy restaurant which offers dishes such as fish, pasta and salads. The diversity of food options at Mahane Yehuda Market reflects the multiplicity of tastes in Israeli cooking. The Market is a culinary representation of Israel’s culturally diverse society, which, over the decades, has absorbed immigrants from across the world, each of them bringing with them recipes and culinary inspiration. Take a walk through the lanes of the market and sample some of the sweets (favorites include Marzipan Bakery), spices, breads, cheeses and hot dishes at the various stalls. If you are looking for a sit-down meal try Hafinjan, a restaurant that specializes in Middle Eastern specialties such as savory meat stews and kubeh soup. Hatzot Steak House, just outside the market, is another crowd favorite, serving a variety of meat dishes and Middle Eastern Cuisine. The Market has undergone a gradual process of gentrification over the years. A number of upscale restaurants have opened which specialize in creating a balance between traditional and modern cuisine. Such restaurants include Hamotzi (North African inspired); Jacko’s Street and Mahneyuda, a restaurant which has received widespread acclaim. Each of these restaurants use fresh produce from market vendors. Jerusalem’s City Center has hundreds of restaurants, ranging from fast food stores and falafel shops such as Moshiko on Ben Yehuda, to quaint, character-filled coffee shops and high-end restaurants. If you are seeking a unique atmosphere and a good cup of coffee, visit Tmol Shilshom, located in a 130 year-old building in Nahalat Shiva. The cafe has a literary feel –it was named after a book by Nobel laureate S.Y. Agnon – and often holds book readings. Another delightful coffee shop is Cafe Kadosh, which is known for its charming, old-school atmosphere (it first opened in 1967 and is one of Jerusalem’s oldest cafes) and delightful pastries and coffee. High-end chef restaurants such as Canela, Lara and Gabriel, are highly popular amongst locals and tourists, and serve a wide variety of dishes, from traditional Middle Eastern dishes to French cuisine. For those who enjoy seafood, Dolphin Yam – up the street from Canela, Lara and Gabriel – is a popular restaurant that has been around for some 40 years. For those looking for a less formal setting, have a taste of sabich, an Iraqi eggplant dish at Hasabichiya, or visit one of the handful of falafel and pizza stands on Ben Yehuda Street. Once you have completed your meal, try some frozen yoghurt or ice-cream at one of the handful of ice-cream stores on Ben Yehuda. The German Colony is one of the most popular destinations for locals and tourists in Jerusalem, primarily on Thursday and Saturday nights, and Friday mornings, but also throughout the week. Most of the restaurants in the German Colony neighborhood – about a 10 minute bus ride from the town center – are scattered along Emek Refaim, a bustling street with buildings dating back to Ottoman and British Mandate times. Emek Refaim is home to restaurants, which are open throughout the day, specializing in breakfast, lunch and dinner. These include Luciana and Caffit, which are both kosher and do not serve meat dishes. If you are looking for a moderately priced meat meal, try Roza, which also has good options for children. Other popular restaurants include Joy Grill and La Boca, a South American style restaurant located on the second floor of an old Templar home. Moshava 54 and Focaccia Bar are great places to go to if you enjoy the feel of a restaurant-bar and are looking for a broad selection of alcoholic beverages with your meal. Jerusalem’s First Station complex features restaurants, a gallery, stalls, and an extensive line-up of cultural activities and entertainment. The 19th-century European and Templar design of the complex is a great backdrop against which to enjoy a wonderful culinary experience. The complex includes gourmet restaurants such as Adom which specializes in sea food and fresh fish, Italian and French chef dishes; and Kitchen Station, a boutique coffee shop and chef restaurant, run by three chefs: Ram Yedid, Avner Angel, and Ron Finchi. Landwer Café serves Italian-Mediterranean style food, updated seasonally throughout the year, and the soon-to-be open cafe Fresh Kitchen, is part of a chain based around healthy eating. At the end of your meal, enjoy some ice-cream at Vaniglia or some freshly squeezed juice from re:bar. As you know, visiting museums is a wonderful, but often appetite-inducing activity. Whilst visiting Jerusalem’s Museum District – which includes The Israel Museum, Bloomfield Science Museum, The Bible Lands Museum, and more – take some time out to replenish your energy with a delicious snack or meal. The Israel Museum is home to Modern, a moderately priced meat restaurant which offers traditional Jerusalem cuisine, with a contemporary twist. One can eat at Modern without buying a ticket to the museum, so it is easily accessible if you are visiting one of the other museums in the area, or would like to visit after museum hours. If you are looking for a lighter meal or snack, try the Israel Museum’s dairy cafe, Mansfeld. Consider a meal at the Kohinoor restaurant at the Crowne Plaza Hotel, a short drive away. Kohinoor is one of Jerusalem’s only Indian restaurants. Just a short drive out of Jerusalem of between 20 to 30 minutes, one can enjoy an atmospheric meal amidst beautiful mountain scenery, and perhaps more importantly, some peace and quiet. 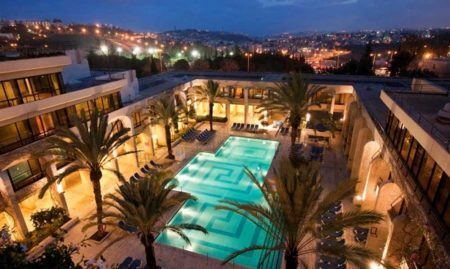 Popular destinations include the areas surrounding Ma’aleh Hachamisha and the Judean Mountains, and the village of Abu Ghosh, which is highly popular for its falafel and hummus eateries.